Earlier this year Pinch Media released a report on the state of the App Store, describing some of the trends it had seen as developers tried to monetize their apps. The verdict: advertising on free applications simply can’t match the payoff from even the least expensive ‘paid’ applications, and would require an unobtainable $8.75 CPM to reach the same income per install. AdWhirl, the iPhone advertising platform formerly known as Adrollo, begs to differ. Since launching last month, the company has signed on over 10% of the top 50 applications in the App Store and is serving 250 million ad impressions per month. And their data tells a different tale. According to co-founder Sam Yam, one of the fundamental flaws in the Pinch Media report is that it assumes that applications only show a single ad impression per user interaction (in other words, every time you open a free app, you only see one ad). Yam says that applications actually tend to serve 3-5 impressions each time a customer interacts with them, with even higher figures for some especially engaging applications. And when you divide that $8.75 CPM by 5, things become much more reasonable. The AdWhirl report, embedded below, says that applications that crack the top 100 in the Free Apps list make $400-$5000 a day – a wide range to be sure, but even at the low end that works out to around $12,000 a month. Among these top apps, AdWhirl is reporting an impressive $1.90 eCPM and 2.6% CTR. And while applications that do reach the peak position in the App Store eventually lose steam, revenue tends to remain consistent over time after the initial dip (see the graph below). Of course, making it to the top of the Free Apps list is easier said than done, and most developers make far less than $400 a day. But the same is true of the vast majority of paid applications too – in fact, there’s actually less competition on the Free side of the store. As for AdWhirl, it seems like the startup is off to a great start. The company allows developers to tap into multiple iPhone ad networks at once, allowing them to compensate when one network doesn’t have enough ad inventory (something that AdWhirl says happens as much as 40% of the time). Finally, it’s important to note that it’s obviously in AdWhirl’s interest to promote iPhone advertising, since that’s their business. 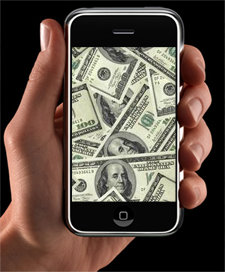 But it’s clear that there are definitely quite a few free applications making good money,.